If you enjoy arguments and strongly voiced views in American media and halls of power, the 2016 Aries Ingress has you covered. If you like action movies and explosions then 2016 may be your year. This year will twist and turn with a feverish, unpredictable vigor, even violence. Everyone will have an opinion, and the debates will be loud and clear. The public sentiment will be whipped up to a fever pitch. Can those who hold the strings maintain control? 2016 is surely the year of authoritarian sentiment in a segment of the voting public. Unsurprisingly, in the 2016 Aries Ingress, Mars and Saturn are both in the first house of the people. The public mood will be unpleasant. 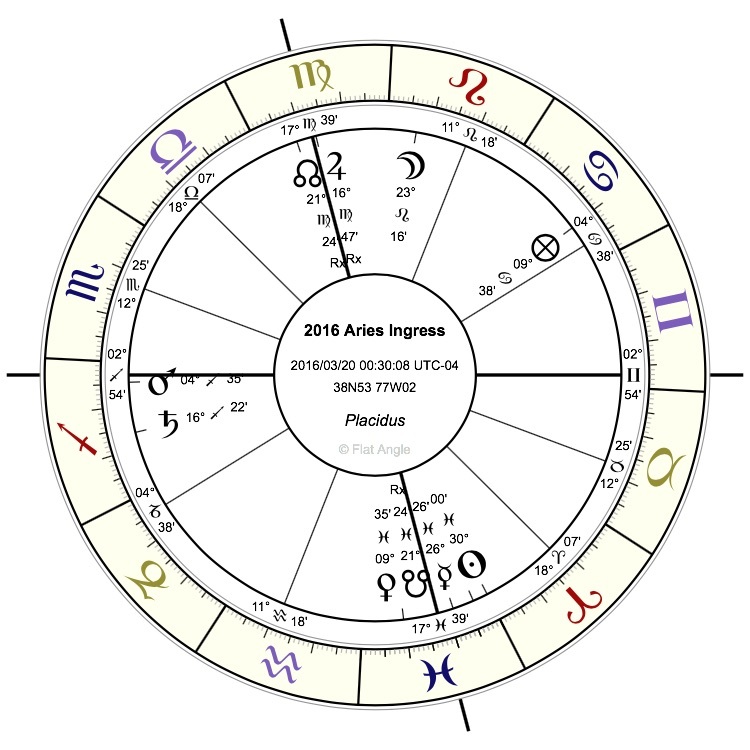 Saturn is the planet of fear, and in this chart rules the second and third houses; financial fears and phobia of one’s neighbors makes public discourse aggressive and bloodthirsty. This is surely the year of electoral surprises; the Moon in the ninth house puts the focus on law, judges, and lawyers, foreign countries and foreigners, as well as religion. All of these will be part of a highly combustible blend this election season. The people, too, are shown by the ruler of the first house, Jupiter in Virgo. As William Ramesey has it, the populace will be well enough in health and body but will not have much money, for that is the nature of a benefic in detriment. Virgo especially speaks of modesty and only minor gains. The American people are just getting by, and it feels as though the wolf is at the door once again, with Jupiter square the ruler of the second house of money, impoverished Saturn. The public mood will be unpredictable and we will crave change without a specific destination, as is typical of a mutable sign. Jupiter is retrograde, leading to sudden turns and changes in the narrative. This year’s election season has been unpredictable, and with Jupiter rx, it will continue thus. We see the outgoing President shown by Mercury ruling the tenth house at the end of Pisces. Late degrees suggest endings. Who will be the next President of the United States? Every Aries Ingress for a Presidential election year has had the answer; the 2016 Aries Ingress is no exception. If the Democrats are the tenth house and the Republicans the fourth house, the Democrats seem rather better positioned to win this year. The tenth house is bonified by the presence of Jupiter and the North Node. Jupiter is retrograde and moving away from the tenth house cusp, suggesting that the Republican challengers will not enter the White House this time around. Mars and Saturn in the tenth house from the fourth – the house of glory of the Republicans does not bode especially well. Yet, the Democrats’ tenth house is ruled by a debilitated, combust Mercury. I suspect the Democrats will win but only a minority will be really happy with the candidate. If so, the newly elected President will face an uphill battle in 2020, but that is another story for another day. There is the possibility – or perhaps the likelihood – of this year’s theme, Litigation, impacting the Presidential election, as well. Bernie Sanders already sued the Democratic National Committee for penalizing him when his staffer accessed material belonging to Hilary Clinton’s campaign. There will be more of the same, in both the major parties. Following Justice Scalia’s death, the President will seek to fill the resulting vacancy on the nation’s highest court. Jupiter square Saturn is angular for Washington, D.C. this spring, promising spirited confirmation hearings. All changes on the U.S. Supreme Court since the last Great Conjunction happened under a Jupiter-Saturn square or opposition, and I expect this year to be no exception. Justice Roberts was sworn in September 29, 2005, with Jupiter applying to square Saturn. Justice Alito was nominated October 31, 2005, about six weeks before the aspect perfected. Then, Justice Kagan was sworn in August 7, 2010, under Jupiter opposite Saturn. The fact that Jupiter is square Saturn in the tenth and first houses of the 2016 Aries Ingress, means that the debate surrounding the nomination will be front and center this year, particularly in the spring. Certain Republican Senators and Representatives have made statements that there will be no hearings held while President Obama is in office. The Jupiter-Saturn square promises otherwise; there will be a very public debate, perhaps because of the possibility that if the decision is held over until next year, it may well be President Trump making the nomination, who has not yet shown signs of listening to the Republican Party. During May 2010’s opposition between Jupiter-Saturn in mutable (common) signs, the Affordable Care Act was passed and a number of states immediately commenced lawsuits against the federal government to avoid having to comply with the ACA’s requirements. I expect similar scale of litigation this year, coinciding with the Jupiter-Saturn square. It may pertain to the elections, and we may see wide redistricting changes following the SCOTUS refusal to grant a stay in a case regarding racial gerrymandering. This is important in any year, but especially this year. North Carolina’s elections and primaries were pushed out to June 7, and the new maps drawn are still not satisfactory to the plaintiffs. These changes and delays may well affect the timing of close Presidential nominations this year. The last Jupiter-Saturn opposition in Pisces and Virgo, respectively, aligned with the Deepwater Horizon explosion on April 20, 2010. The explosion and ensuing oil spill is considered the worst oil disaster in U.S. waters. Mutable signs are inherently unstable, and in an opposition, something is going to give. We can expect news of other types of explosions with the upcoming square, though more of a conflagration due to Saturn’s presence in fiery Sagittarius rather than a spill. The opposition also coincided with the PG&E gas explosion in the SF Bay Area that devastated part of the urban landscape, and a much smaller oil rig explosion. Fortunately that oil rig was not in production and the damage was insignificant in comparison with the Deepwater spill. In the 2016 Aries Ingress, Mars also gets in on the game; he is the most closely angular planet in this Ingress. With Mars in Sagittarius, think projectiles, fireworks, and other fiery arrows shooting through the skies. The image for the first decan of Sagittarius in the Liber Hermetis is “a man having a head of a dog, extending his left hand to the lower part, he holds something sharp. It is however a small weapon with points. He is girt with variegated net all the way to his thighs.” In Austin Coppock’s 36 Faces, he associates this decan with “the secrets of propaganda, which infect the psyche,” emphasizing that this face is “defined by…capability for movement but also…potential for violence.” (193) This year, the people are a vehicle for intense emotion, even barbarity. There is a favorable side to the Jupiter-Saturn square tied to solving problems signified by the tense square. The square on August 3 last year led to the announcement of the Clean Power Plan, which included the first EPA restrictions on carbon pollution by U.S. power plants. Needless to say, litigation by states followed, and the Clean Power Plan is now stayed per a SCOTUS ruling until after the U.S Presidential election. Believe it or not, this only scratches the surface of this fascinating Aries Ingress. As the year evolves, I will comment more, because Sagittarius is the sign of fast movement (four legs!). By this summer, the Aries Ingress will seem like ancient history. Thanks, Nina. That was an excellent article. You’ve given us much food for thought. Thank you, Todd! This chart has so much stuff going on that I have a lot more to say, but felt it would be far too long for one article. Eric, I agree. It occurred to me that perhaps it meant a third party candidate could win, though that seems unlikely right now. In the sample of election year Aries Ingresses, that only happened once, which is far too small a sample size from which to draw any real conclusions. Thank you, Kelly. Time will tell if it’s right, but horaries I have read so far with Mars in Sagittarius seem to point to a very militant and even violent attitude. Sagittarius is the only zodiac sign that carries a weapon. I don’t know if anyone really believes that Trump is likely to win the general election. Certainly people on the left and right fear it, but he cannot even reliably capture the majority of all right-wing voters. The other big question is whether Trump is Jupiter at all. It is possible that the Republican convention will be contested, meaning that despite him getting the most candidates, the party will simply decline to nominate him. As I mentioned in another comment, we have had one election won by a third party candidate, so as far as my technique goes, a third party candidacy is mostly uncharted territory. The idea that planets on the outside of a cusp control that house (I think John Frawley writes about this) does not seem to work in this method. I refer you to, for instance, the election of 1884, when the Democratic challenger, Grover Cleveland, defeated the Republican nominee – the Republicans controlled the White House for many years until this election. The Republican nominee would be Mercury, ruler of the tenth house of the incumbent party, sitting on the fourth house cusp. Under the controlling-via-cusp theory, the Republicans should have won, but they lost. There are other compelling testimonies in that chart, but this is not one. The U.S. has been polarized for many decades now, but what is interesting about August 2017’s eclipse is that it will be the first with a path of totality crossing the USA’s Pacific coast and Atlantic coast since 1918, according to Wikipedia. You are very right in that this will be a major event in U.S. astrology. I believe these are “interesting times,” per the Chinese curse theory. priority must be given to Lords 1 and 7, which are our main significators. So here we have to manage without Lords 10 and 4. … no antiscia: no judgement. should be enough. Now it’s much easier to see. Obama AND Hillary (Jupiter) are going home, to the fourth house, via antiscion. Jupiter is also like an army besieging a city, but withdrawing: In detriment. Feeling sick. It’s retrograde. Therefore losing power. Meanwhile Trump (Mercury) via antiscion, is promoted to the 10th house, which in an election is what it’s all about: It’s the government. So far on the 2016 election. The Republican candidate is Jupiter. The Democratic candidate is Mercury. Saturn is thwarting and stymieing him, Pluto, Neptune and antiscion-Mars are like dark clouds approaching. That doesn’t look good for our Republican: James G. Blaine. Then to Mercury which rules Grover Cleveland, it lands safely in the now sunny 10th house. Sunny, because both the Sun and Mercury via antiscion, wind up in the 10th and are no longer seperated by the 4th house cusp. Blaine seemed to have a hold over Cleveland because of the latter’s illegitimate child-scandal. Until Blaine’s spokesman, Reverend Dr. Samuel Burchard, made an anti-Catholic slur. The statement energized the Irish and Catholic vote in New York City heavily against Blaine, costing him New York state and the election by the narrowest of margins. Thank you for sharing your insights and for looking at actual charts. One of our challenges is that all techniques will work for a handful of charts, but the only thing that worked on most of the charts was the aspect technique that I explain in the analyses of charts going back to the mid 1800s. I have yet to see anyone demonstrate a different technique that worked on all of those horoscopes, for every single election year. If they did, I would be very happy to use it. Self correction: About Saturn in the 1884 election, it cannot be dispositor of the Moon and Malefic at the same time. So instead of harming Jupiter, read that Saturn as helping the Descendant. BTW, Jupiter itself is also dispositor of the Moon, helping the Descendant. That means it can’t be Lord 1, because being Moon’s dispositor trumps rulership. So Jupiter is nullified as Lord 1. The 1st house does have Moon bodily as well as via antiscion, so quite formidable, but too far from the Ascendant. Not enough to win. While the two Moon-dispositors, Saturn and Jupiter are very close to the Descendant, which strengthens the Descendant more than the Ascendant. Meanwhile: I’m working on a method that always works. Much positivity to self-critical astrologers everywhere. We are fallible, the planets are always right. Very interesting, Thorsten! I did not know that his progressed Sun will conjoin the Ascendant, but you may be right. Certainly a presidential run would lift his profile. Also note that he will enter a Gemini profected year. This is opposed by the transiting Saturn in Sagittarius, which will also oppose Mercury (his Lord of the Year) in the Solar Return for 2016. I sense a big disappointment. I am not an experienced at reading ingress charts. However, one thought I have, when looking at this chart, is that it almost seems like the Republicans are intentionally destroying their chances of winning the WH. Mars rules the radical 12th house-of-self-undoing, and he sits on the AC, which is the Republican’s turned 10th house of victory. Saturn in the first squaring Jupiter (the Repub’s sig) also shows them blocking their own leader. Even the MR of Mercury and Jupiter can be read this way—Jupiter in Virgo on the 10th shows the Repubs using their own weaknesses to protect the Dem’s control of the WH. I have read a few news articles which suggest that the Republicans may just concede this election cycle because their own party is in such dissarray right now.